The Seesoft CE-Level 2 back protector insert is designed to absorb variable impacts without compromising on comfort, ventilation or freedom of movement. The highly impact-resistant blend of Nitrille and Polynorbornene rubber results in a memory foam that is multi-impact rated and CE certified to the highest level (EN 1621-2:2003 – level 2). To choose a back protector, visit the product page for the jacket you have as we have specified which back protector is appropriate. Also, look inside the jacket you have; on more recent model jackets the inside of the lining where the back protector is inserted has a tag to indicate the type of back protector and the appropriate size. 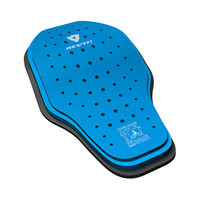 We are carrying two types of back protector inserts, the KN and the RV. For installation instructions, see here. We have the current selection of upgraded Seesoft back protectors available for REV’IT! jackets. REV’IT! engineered the Seesoft back protector insert with the aim to create a low profile, flexible and breathable protector with the highest, CE-Level 2 certification. The result is a non-distracting, pliable back protector that can absorb multiple impacts without compromising on comfort, ventilation or freedom of movement. 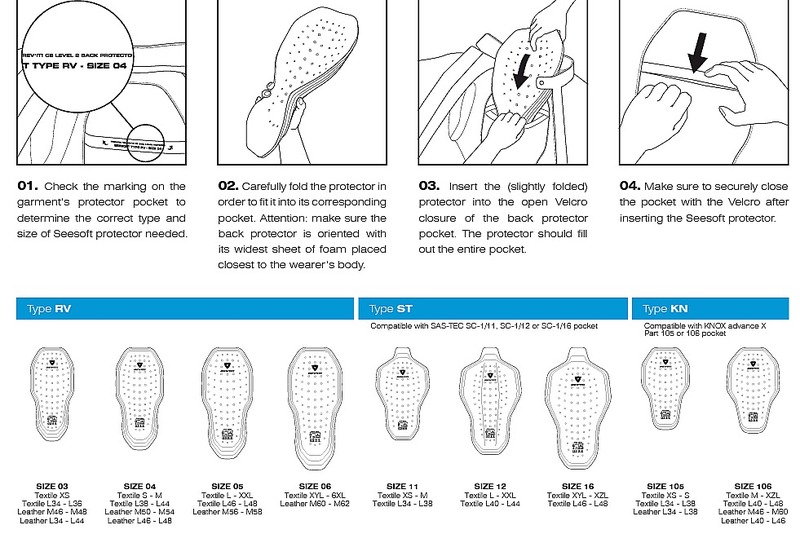 There is a link above showing you how to install the back protector. It’s pretty obvious how to get it in the jacket, but you need to put the back protector facing the correct way. The key thing is to put the largest piece of foam against your back. PS: We put together a short FAQ about armor ratings that will give you some info about the CE/European standards listed for this product. Please go here to have a look. This is a "must have" item if you have a Rev'it jacket. Fits perfectly into their built-in back compartment and is made up of multiple impact absorbing layers. As usual, great service from MG.